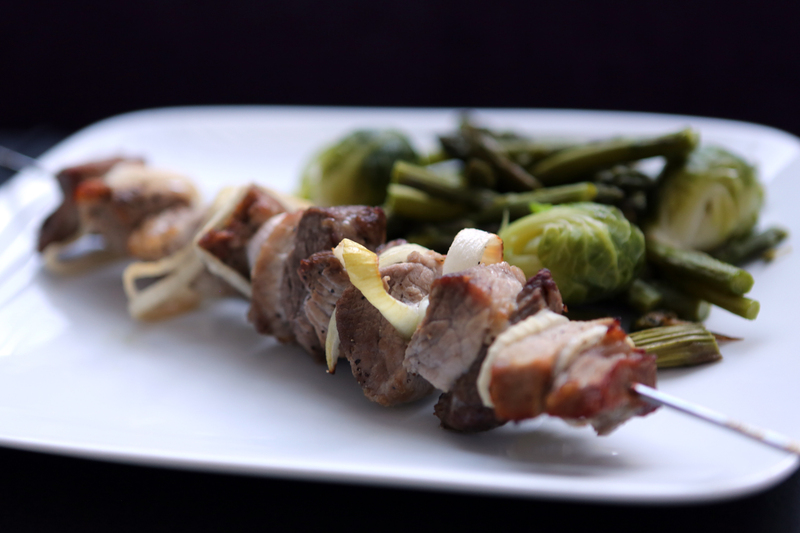 Kebab is originated from Middle East, this dish contains pieces of meat, fish, or vegetables roasted or grilled on a skewer. Or Šašlõkk like we called it back home in Estonia. I especially liked the marinade my dad used to make. I have been too lazy to try it myself before but now with the grilling season ahead of us I really wanted to have Šašlõkk/kebab. It´s a very easy recipe. I tried it with pork and with chicken fillet. I prefer chicken. But it is really up to you. 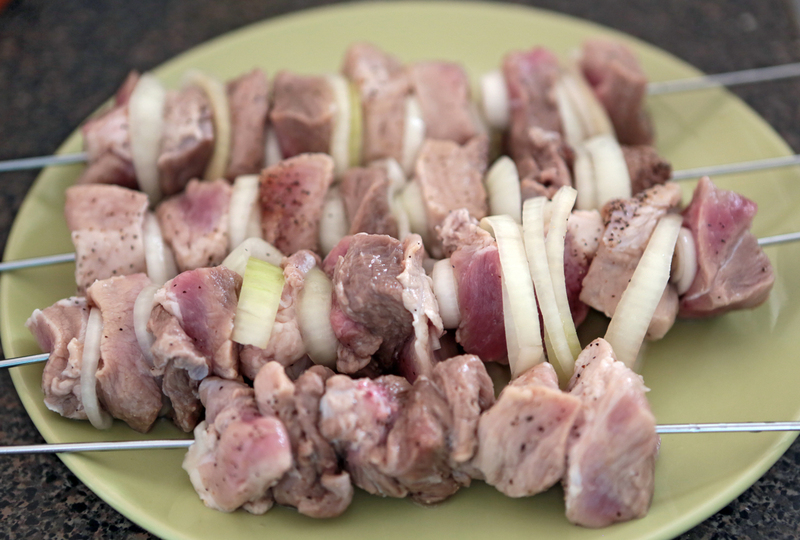 For the best result the marinade with the meat needs to sit for 24 hours before you cook it. 1. Cut your meat (chicken, pork, lamb or whatever you choose to use) into cubes. Put into a bowl, preferably with a lid so it´s easier to put it into the fridge after. 2. 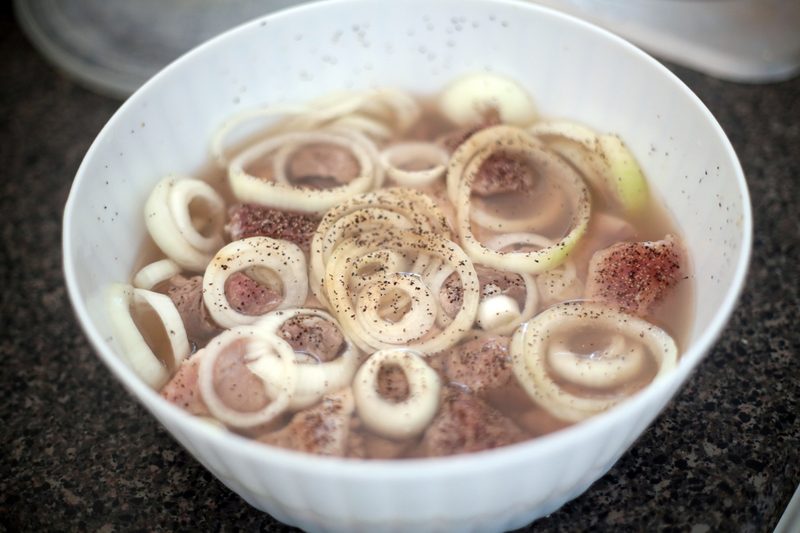 Cut your onions and lay them underneath and on top of your meat. 3. In a 500 ml cup mix together warm water with vinegar, sugar, black pepper and salt. Mix well. 4. When the sugar is melted pour the mixture onto the bowl. It should cover all the meat. 5. Put away for at least 6 hours, overnight is preferred. 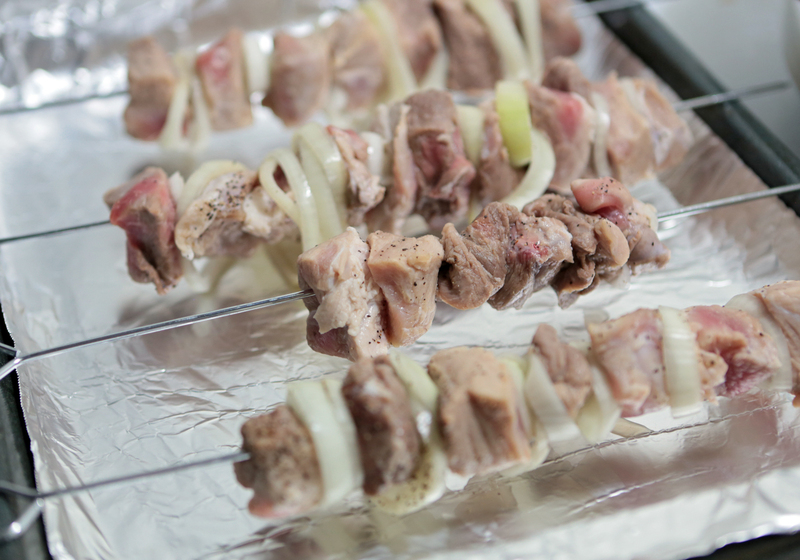 When ready to use put the meat onto the skewers, adding the onions in between. For pork put it on custom broil for 20-25 minutes, turning over half way. 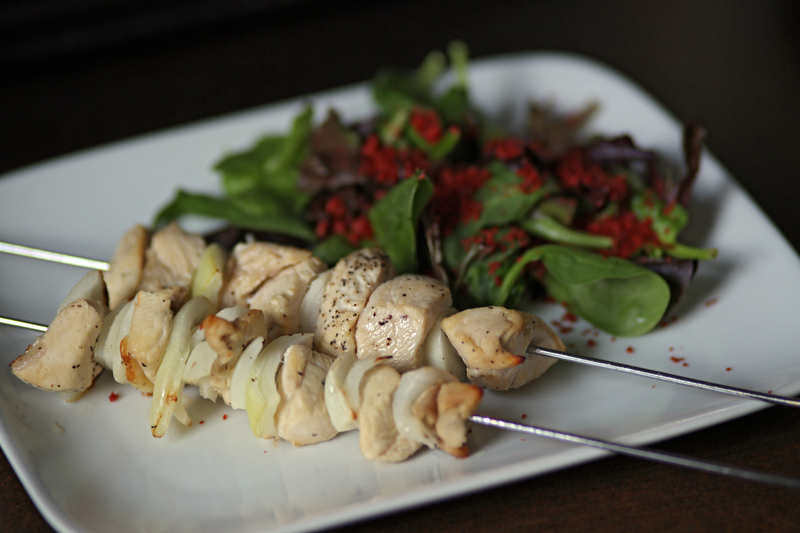 For chicken also use custom broil (500F) but chicken need less time 15 – 20 minutes, also turn over half way. I cooked it in the oven since we don’t have a backyard but with saying that I have to admit they were delicious! We left a little gap between the pork and baking pan and covered the pan with foil paper. But chicken we just put straight onto the baking pan and that’s the way to do it! Don’t leave a gap. Of course you can add any kind of vegetables in between your meat but I just like it like that. This marinade brings back so many memories. I do have another good marinade recipe that I like very very much but this is my absolute number one! It will be the most delicious chicken you’ll ever taste 😉 I would not mess with this recipe, add any other ingredients or take something away, it´s perfect. I usually end up with the combination of lemon juice, garlic, olive oil and rosemary or oregano.